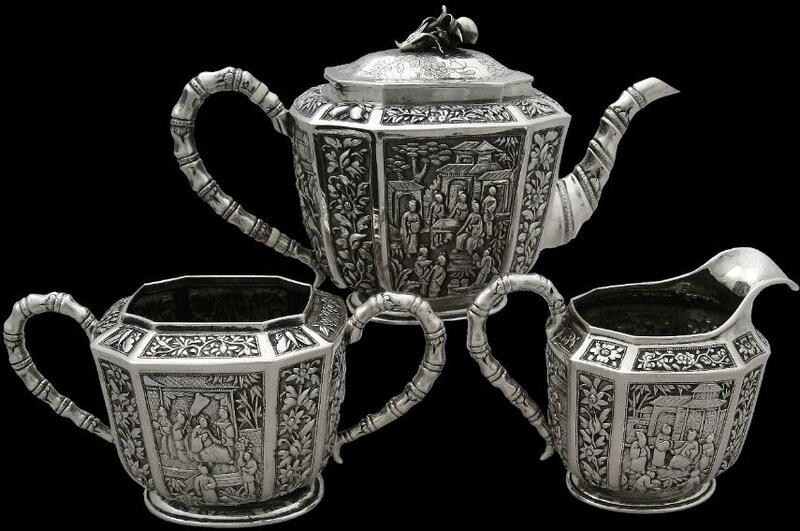 This beautiful three-piece ‘bachelor’ tea set is of thick gauge silver. Correspondingly, each piece is heavy in the hand. Each of the three pieces is finely chased and engraved with many highly-detailed typically Chinese scenes: many show scenes of battle and the emperor and his court. Between the scenes are panels of finely executed flowers and foliage. The shoulder of each piece is decorated with panels of auspicious flowers, fruits and butterflies, including finger citrons, winter melons and persimmons. A blank armorial cartouche is on the reverse sides of each piece amid the scenes and flowers. 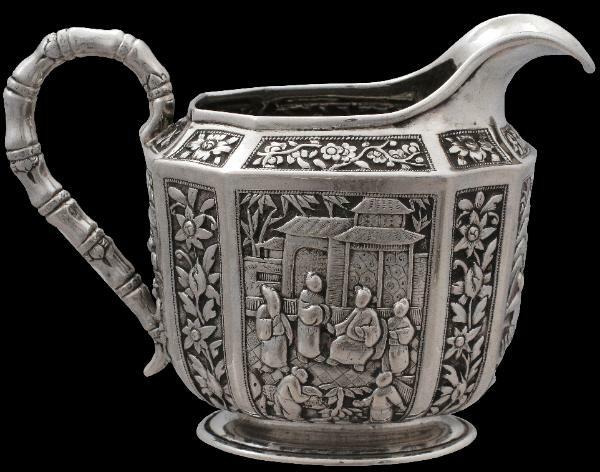 Each has handles of stylised bamboo; the teapot’s handle is interspersed with two segments of ivory to insulate the handle from the heat of the tea. The spout is similarly in bamboo form. 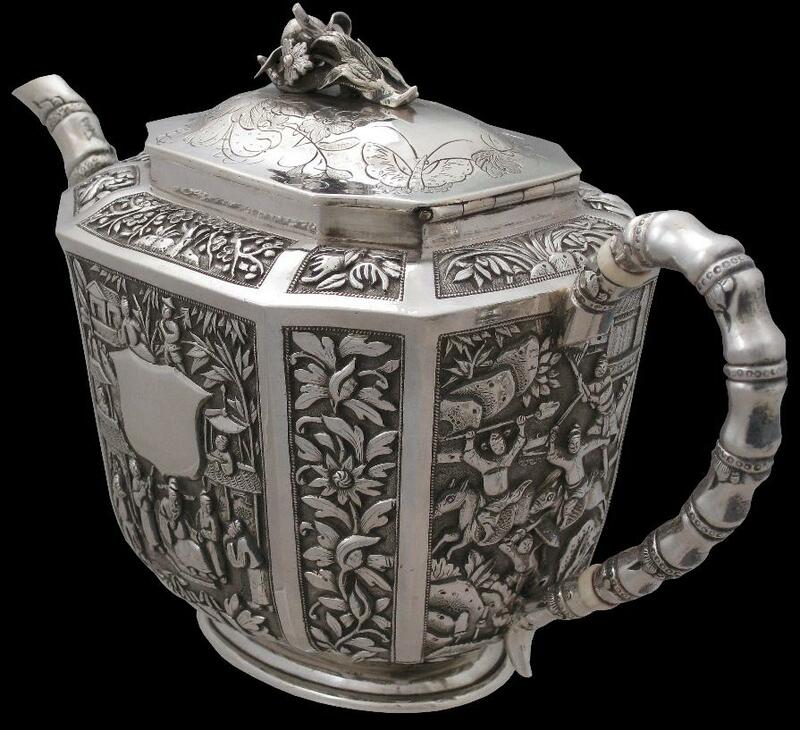 The lid of the teapot is delicately engraved with a bat and a butterfly as well as berries, leaves and flowers, and surmounted by a particularly fine arrangement of flowers, leaves and a solid-cast persimmon. The base of each piece is stamped with ‘LC’ and a Chinese ideogram. Leeching was a silversmith and jewellery firm that operated from the early 1840s to the 1880s at various locations in Guangdong (Canton) such as East Street, Sai Hing Kai and Club Street in Guangzhou, and 24A Queens Road in Hong Kong. There also an outlet in Nanking Road, Shanghai. 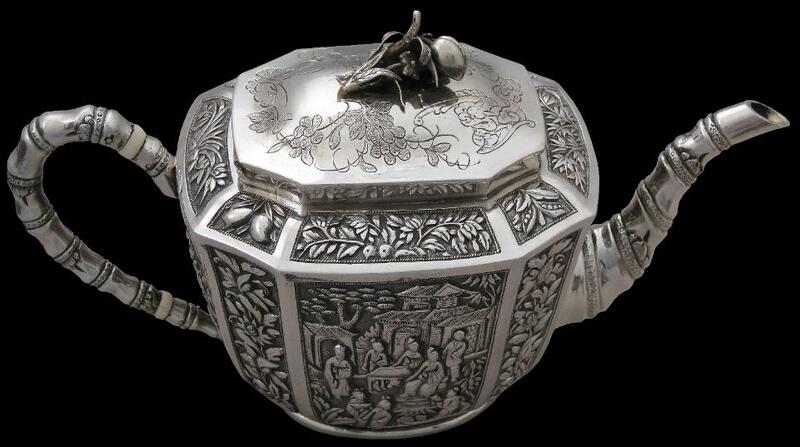 It enjoyed an excellent reputation for producing the finest items of export gold jewellery work and items in silver. 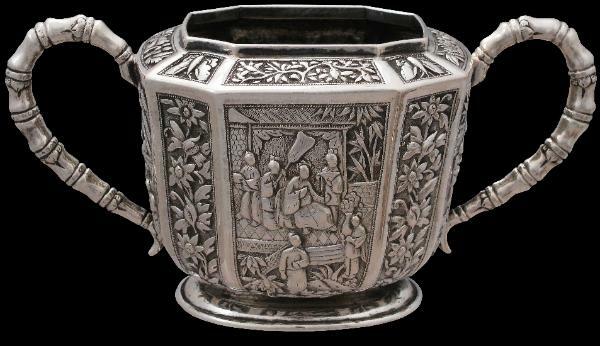 The Chait Collection of Chinese Export Silver, Ralph M. Chait Galleries, 1985. Acquired from the UK antiques market.